Inkjet printing technology are seen as novel techniques for the deposition of functional materials. An example in the area of printed electronics is silver, as it exhibits high conductivity and reduced influence of corrosion due to the formation of conductive oxides. Stabilized nano-particles may be dispersed in organic solvents or water, and steps must be taken to avoid particles clogging the nozzles when their diameter exceeds 5 % of the nozzle diameter. More importantly, high temperatures with respect to the underlying substrate are needed for sintering of the stabilized particles. This recent paper describes how a cold plasma at atmosphere can be used to create a simpler one-step silver printer. 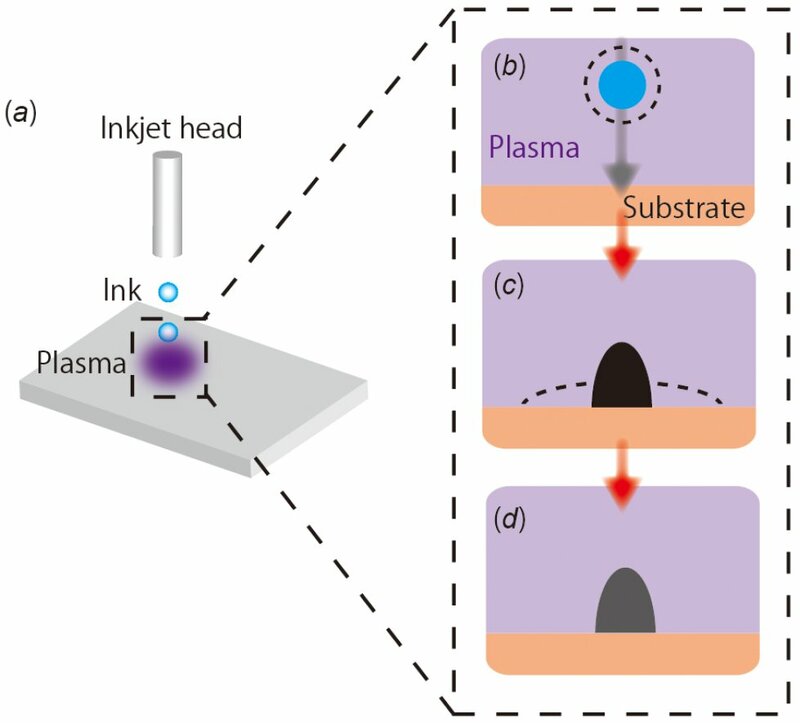 Novel plasma-assisted inkjet printing, where inks during flight and after landing on a substrate are irradiated by atmospheric-pressure nonequilibrium plasma, is developed as a rapid one-step process without any pre-/post-treatments. A silver line with good electrical conductivity was fabricated on a polyimide. Compared with heat treatment, the line shows lower electrical resistivity and a narrower line width even with a much shorter treatment time.